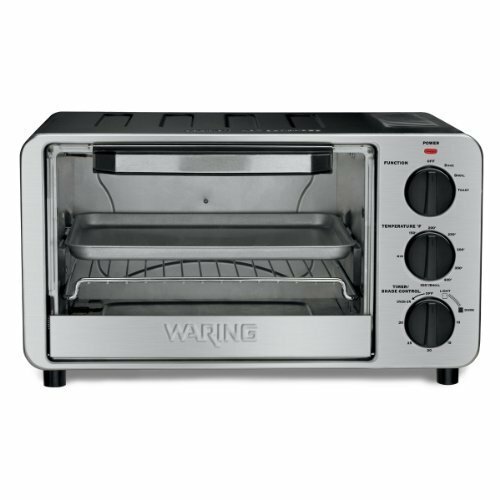 Waring WTO450 Professional Toaster Oven is a much popular model that sells quite well on online stores. It has three modes of cooking embedded in, which is baking, broiling and toasting, making this product a good choice at a reasonable price. You can choose your cooking mode easily with a turn knob. The capability of this oven is 4 slices and can be used to bake medium sized pizzas. 1500 Watts of Power – It has 1500 watts of power that gives an extraordinary cooking experience that other toaster oven at the same price can’t do. It’s a little expensive on the energy side however saves time. Trays and Pans – It comes with a baking tray, a wire rack and one crumb tray to facilitate different cooking options from baking, broiling and toasting. These can be easily switched according to your cooking requirement. Temperature Range – The oven provides a wide range of temperatures to choose from between 150 to 400 degrees Fahrenheit, means you can cook most food from your daily breakfast bread to meat. Warranty – Waring offers one year product warranty ensuring your safe investment. What Do Users Talking About the Waring WTO450? Price – Most users said that Waring PRO WTO450 is an easy-to-operate product within a very low budget. It has three basic cooking functions and is suitable for small families and personal use. Timer – A few users liked this oven because most ovens at the same price doesn’t offer an Always-On mode but this model can operate either in Always-On mode or using the timer. Space Saving – In my research, some user said its actual measurement is smaller than the dimensions described. Its actual measurement is 9″H x 12.5″D x 15.75″W and can easily fits on your kitchen countertop. Fashion – Steel finish of the housing gives a pretty sleek and professional look to the oven. No Convection – It’s a pity that it does not have convection function. This oven does not come with updated convection cooking technology, which means the food might not be evenly cooked and there might be a need to recook. Safety Issue of Rack – You have to be careful when pulling the rack forward to retrieve food. Some users said the rack moved fast and it would fall out on a few occasions. There is not a lip to keep the rack from coming out too far. The trays and rack are also a bit flimsy. Temperature – Some users found that the temperature settings are off scale to about 40 degrees, so you have to take care while operating this oven. Furthermore, its steel housing makes it pretty hot while operating, causing risks of burns and you need to be really careful touching while the oven is still hot. It is overall a good product with appreciative performance as compared to other toaster ovens below $50. Being affordable, user friendly and simple to operate makes this model worth your money.